'Through - this door, be proud - As a blackbird, - Where the humble fern - Blossomed to stone,- Then look back again. This - Door. The Taliesin Stones at Strata Florida Abbey. 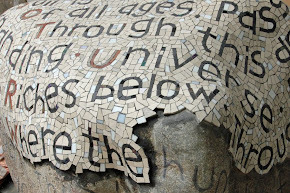 Two poems by Gwyneth Lewis, my role is to present them using mosaics. The abbey was originally founded in 1164. 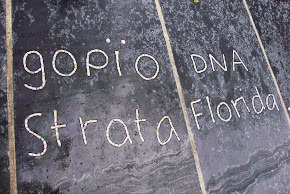 The name Strata Florida is a corruption of the Welsh Ystrad Fflur, meaning Valley of (the river of) Flowers, according to Wikipedia. For more information about the Abbey (click here). Through this door as the poem suggests are the remains of the Abbey. I grew up in SE London and I was reminded of a similar ruin, Lesnes Abbey in Abbey Wood. I sometimes went there on my bike through the woods during summer holidays. It was difficult back then, and still is now to imagine what these places were really like, back back in the day when they were the centre for the whole area. compared to the serenity if you visit today. 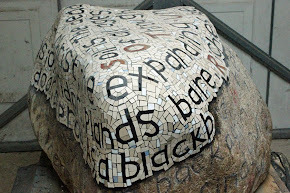 I spent my day arranging the poem on the stone, rubbing it out because it didn't fit, making it fit, moving it around so it fitted better. 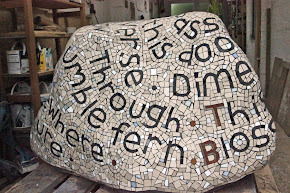 I had a sense of how I wanted it to look, and was able to fit the poem on evenly distributed and spaced over the whole stone. My commissioner asked me if the making of this work was organic? Yes this initial layout was really organic process, intuative and involved many calculated guesses. From here on in it will be more mechanical with a little bit of unkown to keep you concentrating all the time. I am actually really looking forward to starting, but frustratingly I have a meeting in the morning so wont get to work on it till the afternoon. Things will actually be the other way around now. English on the boulder in my workshop and the Welsh on the coping stones, which will be done on site. tiles on with. So I expect to do small sections at a time. 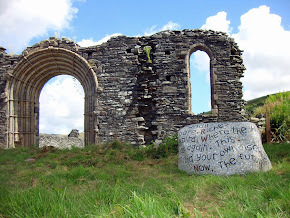 The Strata Florida Abbey monument is in the care of Cadw who have commissined me to permanently display two poems. 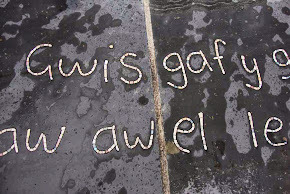 These again commissioned by Cadw and written specifically for the site by Gwyneth Lewis. The Taliesin Stones are what these poems are written on. is a Public Artist. 'My canvas is the street, the building or the park'. I work with many partners including poets, foresters, story tellers, architects, performers, town planners, , educators and community leaders in true collaboration. An Open Day at Strata Florida. You're going to write a poem on a boulder?